In 1865 a baby—too large a baby to pass through anyone’s hips—is born to a couple at the crumbling edge of Europe. This is the boy who will be known and feared variously as Danilo Lazich, Vuk Hajduk, Daniel, and then Danny Savage. By any measure too large, our hero can develop no patience for his determined, dinky fellows. The problem remains the same—he is by one means and another continually wearing out his welcome. When Branko Prpa offers Savage a ticket to America, it comes at a price: Savage must take for a wife and traveling companion Prpa’s daughter Stoja. After completing their marriage vows on snow-covered ground, Savage remarks, “We are nothing to each other but a way out. Once we’re shut of this, you can quit me at any time, sister.” Stoja replies, “I am not your sister.” Family ties, it turns out, will be as complicated and inevitable as Danny Savage’s large size. In America in 1899, the country’s mining camps are running full-throttle, and companies are laying down steel as fast as they can. An American by nature not by birth, riding atop a train into Montana, Savage savors what he’s always dreamt of: endless possibility. Instinct, intellect and force of will enable him to rise above the motley assortment of immigrant coal workers, and he lays claim to a larger piece of the action. In a rough corner of Wyoming, high up in the Great American Desert, Danny Savage finds room, at last, to fully express himself. MATT PAVELICH’s short story collection Beasts of the Forest, Beasts of the Field won the Montana First Book Award. 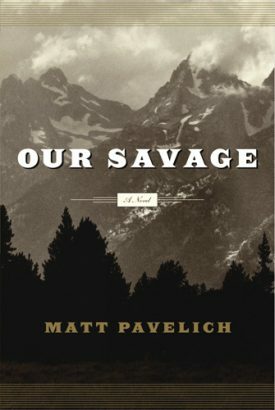 Our Savage is his first novel. He currently lives in Pago Pago, American Samoa.